Looking for a gift that helps your skin glow year-round – even after the tree is down and the holiday decorations are put away? Treat yourself – or someone special on your Christmas list – to an at-home facial device! Bring part of the spa experience home with these at-home facial devices that help skin look and feel cleaner, tighter and more radiant – they’re sure to be the hottest gifts under the tree! Love dermaplaning, but want to bridge the gap between treatments? 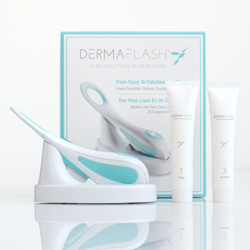 DERMAFLASH exfoliates dry skin cells, built up debris and pesky peach fuzz – leaving smooth, radiant, touchable skin. Includes: DERMAFLASH Facial Exfoliating Device, 6 DERMAFLASH Exfoliating Edges, Prep Cleanser, Soothe Hydrating Moisturizer, charging base and line cord and a 1-year limited warranty. Save up to $37.80 with a Soderstrom VIP Club membership. Learn more at soderstromvip.com. If you’re tight on time, you’ll want to add this micro-current facial trainer to your Christmas wish list! The NuFACE® Infinite Glow Collection device stimulates circulation, drains lymph nodes and tightens facial muscles – giving you a mini face lift in only 5 minutes! Includes: NuFACE Trinity Pro Facial Toning Device, NuFACE Hydrating Leave-On Gel Primer, Prep-N-Glow Dual Sided Cloths (5 packettes), Optimizing Mist, Lifter Infusion Serum, Recharging Cradle and Power Adapter and a 2-year warranty. Save up to $65 with a VIP Club membership. Learn more. This device takes multitasking to a new level! Cleanse and give your face a microfirming massage with one tool that improves radiance, reduces fine lines and tightens the face, neck and décolleté. (Additional brush heads available for body, feet and makeup application). Includes: Clarisonic SMART Profile Uplift Device, Firming Massage Head, Revitalizing Cleanse Brush, Smart Turbo Body Massage Head, Refreshing Gel, USB Power Adapter and a 2-year product warranty. Want to save up to $69.80? Learn more about becoming a Soderstrom VIP Club member. Questions? Tips? Advice? We’re Here to Help! Whether you purchase your device in one of our day spas, or online, or highly-trained staff is available to answer any questions you have about the device – from which skin care products work well with the device to even how to charge and clean the device. If a question arises, stop by any of our day spa locations or give us a call (877.883.7363 for our online store or call your nearest day spa location).